We are excited to announce the GlobalWE's first Women's Empowerment Expo, focused on global women's issues and initiatives, which will coincide with the Harvard Alumni Association's inaugural Women's Weekend from November 4th-6th, 2016. The Expo, to be held annually at Harvard University, will connect Harvard alumni and current students with non-profits and social enterprises in need of volunteers, board members and/or other support. Our goal is to connect our exceptional alumni membership with organizations on the forefront of girls' and women's issues worldwide. For the most current details on the Expo and participating organizations, please see our Women's Empowerment Expo Brochure. For Individuals: The 2016 GlobalWE Women's Empowerment Expo will be held on Friday, November 4, 2016 from 3pm-5pm at the Harvard Business School, Batten Hall, 125 Western Avenue in Boston, MA. Harvard alumni, students, and affiliates are all eligible to attend. Click here to register for the 2016 Women's Empowerment Expo! Please see our Women's Empowerment Expo Brochure for a list of organizations that will be represented at our gathering. For Organizations: To sign up your organization and participate in this FREE event, please register now! 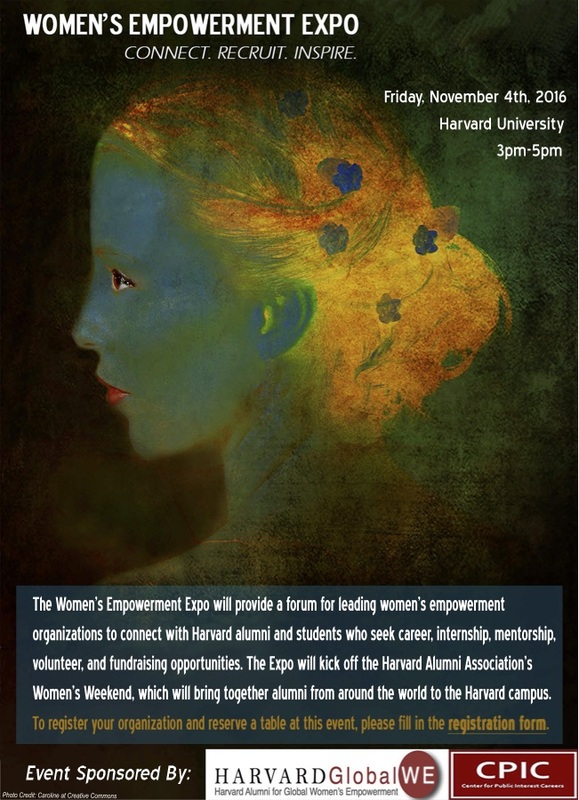 If you have any questions regarding the Women's Empowerment Expo, please contact Tara Abrahams, College '99, Harvard Business School '04 at tara.abrahams@gmail.com. For the most current details on the Expo and participating organizations, please see our Women's Empowerment Expo Brochure.